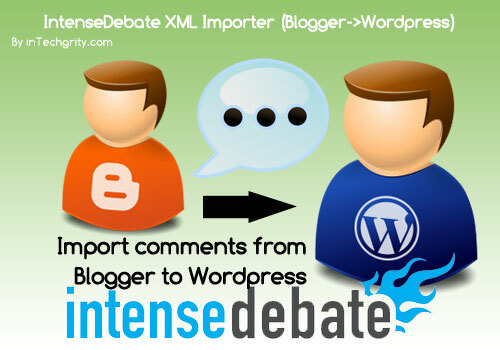 Okay, so after quite a bit of wait, here is our First WordPress Plugin… We have named it, IntenseDebate XML Importer and what it does is, imports your Blogger Intense Debate comment to your WordPress blog. This is very useful if you are migrating your blog from Blogger to WordPress and want to keep your Intense Debate comments while migrating. Update- 13/8/2010: We have released a version 1.0.4. Now the plugin is maintained over WordPress plugin repository. All the download links have been updated. Please redownload if you want. Thanks to Gautam for fixing the plugin and making it at per with current WordPress standard. So, I turned on my Komodo and started editing their existing plugin to work on the new system! After a few hours of work, [probably 1] I finally reconstructed the plugin to work for the new system! You Install and run this plugin. 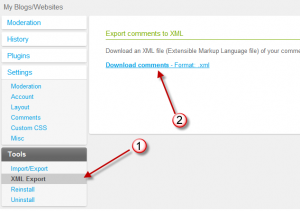 The plugin asks you to upload the Exported XML file containing the backup. You upload it and it inserts all the comments into WordPress database based on the Title of the posts. Also it stops the insertion of any duplicate comments, and it has a Simulation feature which will show you the result without actually importing the comments. Go to your Intense Debate dashboard and select the site. Now under tools click on XML Export and save the file. First download it from the link above! You will find a zip file! You dont need to unzip it… Just keep it handy. Navigate to your WordPress Dashboard » Plugin » Add New » Upload and upload the zip file. Now activate the plugin. 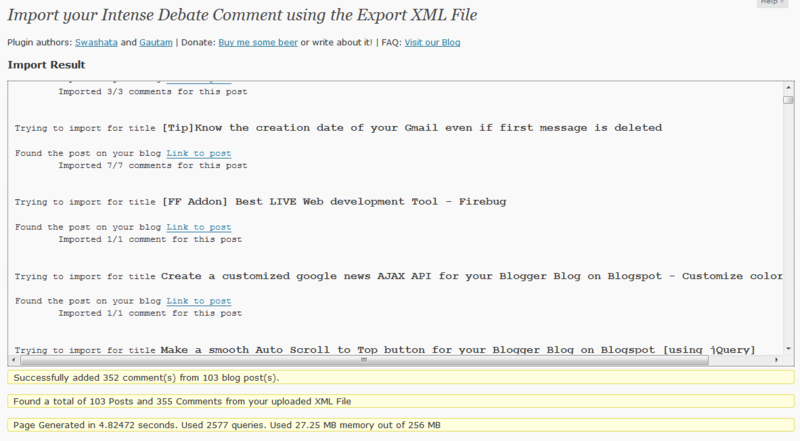 Or you can also search it with the term “IntenseDebate XML Importer” directly from plugin directory and install. Go to IntenseDebate XML Import from the Settings menu from the left menu bar. Browse and upload your file. Also check the Simulation mode. Click on Import and it will show u all the results without actually importing anything. You should be now satisfied with the result 😉 . If not then do drop us a mail and we will see what we can do! And here is a video, showing you the Import with Simulation mode. Also it will explain the new added feature Intelligent Title matching. Automatically sets the timeout to 0 (ie unlimited), to avoid any time out error. Check for duplicate comments in a better way. Thanks to Gautam for adding translate ability to the Plugin. He did a lot to make the code at per with WordPress standard. 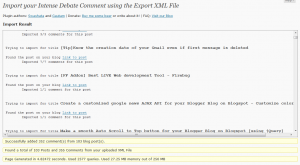 From where can I download the XML file? From [Intense Debate] Dashboard navigate to your Site. Then from the sitebar Click on XML Export. From there save the generated XML file. Can I use Intense Debate as my WP commenting system as well? Of course you can! But before installing ID to your WP blog, make sure to run this plugin once! Else the comments for older posts won’t appear! How can I move my Blogger Blog to WP without changing the Permalink structure? Quite offtopic! But still… [HERE] is the perfect guide for you! Even I have followed the same. And if you still cant figure out how to do it, I would suggest you to ask these guys for a complete paid migration service. I personally know these guys, and they are really good at their services. Every penny you pay to them will be worth! BloggertoWP Service by rtCamp. Do you accept Blogger to WordPress paid migration service? Currently NO, in future maybe! I would suggest you to go for BloggertoWP. So if I maintain the Permalinks, will the existing Intense Debate Account work? Quite intelligent question! Even I thought the same. But the reality is it won’t work! When you install ID comment system from Blogger to WP then the comments according to the Permalink, remains stored inside ID database, not on WP database. So the comments would come on widgets by Intense Debate. But won’t be shown on the actual post pages. So, you should import the comments, then use delete the existing ID site, then reinstall to make it fully compatible! Now the plugin will tell you how much memory it has used. Useful for people on shared hosting. Finds duplicated comments on the name, email and content basis. Removes the IP test and URL test. Dont know why, but Intense Debate shows a blank URL. So removed the URL test. Cool! It’s been years since I wrote that, so it was in much need of an update. Glad to see you were able to make use of my code as a starting point. Nice work. 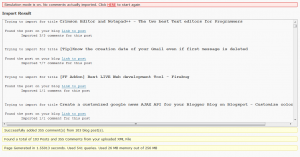 Many thanks, I´ve been looking for this tool, since I decided to migrate my blog from blogger to wordpress. I need help wiht some issue that I don´t know If you can help me. Some of my comments weren´t imported, because the tool didn´t found the equivalent post. But the permalinks are the same? Can I migrate it manually? Very good tool, will consider it when I transferred to wordpress. I have already prepared or blog for this but still do not take that decision. thanks for the explain. but i still like using disqus instead of debate. because it’s more simple. I’ve been trying to search a way to import my blogger comments to intense debate. Is there any way to do this? All right…I am not liking this result! Very useful, but it didn’t work correctly for me. I had 164 posts with 1167 comments on Blogger. On using this plugin, only 364 were imported (98 posts). How to solve the problem? When I try to upload it, I pull an error that it is not a valid xml file. I’m thinking because of the .gz on the end? Why is IntenseDebate adding .gz on the end of the file and is there anyway around this? I recently switched to WP and I’m having this same problem!! I’m having the same issue…but I’m wondering if it’s because my original site is a iWeb site and not a Blogger site (which it seems like this plug in is designed for). Since the creators don’t seem to be replying to older posts, I’m wondering if yours was an iWeb site as well?? Still haven’t figured out how to move intense debate comments from iWeb to WordPress! Looks like there hasn’t been many followups in the last year or so. I’m trying to run the importer, but it’s bombing out and not able to import anything. I’m running WordPress v3.3 Is this plugin still being maintained? I’m getting the same error as Steve. Any fix for this? Hi there, I have used this plugin successfully before, but now it’s not working. I have looked at the whole, long .xml file and all the information is there. 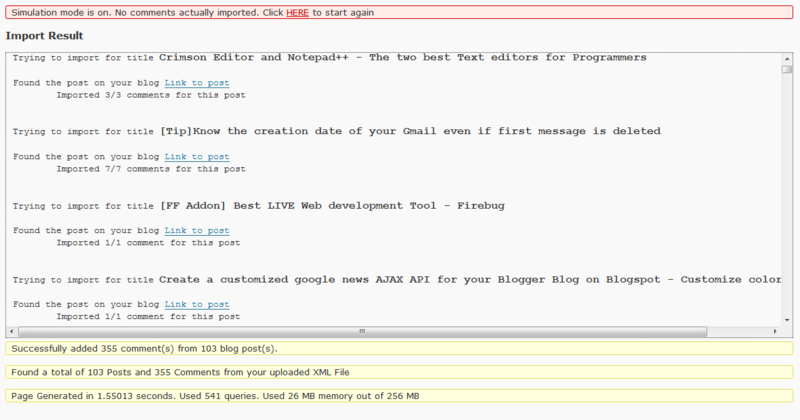 But when I try the simulation, it looks like it only even *attempts* to import comments for two posts! I have a few thousand posts and comments here, but it seems like it’s ignoring all the rest of them – what’s happening? Did you ever figure out what it was? It’s doing this to me too. Works perfect for me in simulation and does this one article/comment import in the real import. Did you end up making it work? Hi, Are you still helping out with the plugin? I can edit and had it work for 90% of my posts in the simulation mode but when I dropped it for the real import, it is not working. It is doing almost one article at a time and imports maybe one or two comments tops and I have to cut out what it imported and redrop it, sometimes it works soemtimes not. Do you know what would be the issue? Maybe a PHP memory or runtime issue. Try increasing both the variables.